I was very hopeful going in to this panel that I would come out with a plan of sorts for how to, maybe, one day, have a book on the shelves of Waterstones. Author, Natasja King. Opening question by the Chair, Geraldine Bedell and the dream was shattered. 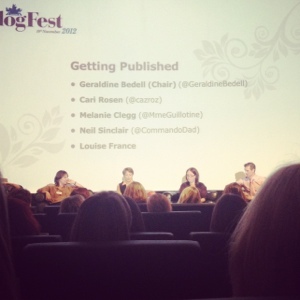 She asked Louise France (contributing Editor of the Times magazine) whether she looks at blogs to find columnists. Her answer? No, people approach her. And for her to consider them the idea should be sharp, with a “finely honed angle”. Felicity Rubenstein (of literary agency Lutyens and Rubinstein) answered that she has just recently taken on her first client based on a blog. However, I got the impression that blogs don’t necessarily, or easily, lead to book deals or column spaces. That being said there is a difference between publishing a book, writing a column for a newspaper, and doing a piece for a magazine. Felicity also said that cookery and craft blogs are generally easier to translate from blog to book, so there is hope if you want to get published. According to Felicity your writing does need to be “finely honed” as opposed to a the “stream of consciousness” style that bloggers use. Neil Sinclair’s (author of Commando Dad) tip to getting published was to “Believe in yourself and believe in your idea”. He went so far as to describe how he had pictured his book in his hand. The feel of it , the look, the texture, everything. He had the image in his head and made it come into reality. As a parting point, we have to remember that even if you do get a book deal, that does not necessarily lead to huge amount of sales. In Geraldine’s own words “What makes a bestseller is word of mouth”. The flip side to all of this is Melanie Clegg (blogging as Madam Guillotine) who is self publishing and making shed loads of money out of. She did however say that she is thinking about, and liking the idea of, holding a hard copy book in her hand and seeing it on a shelf in Waterstones so she may go down the traditional publishing route. Please see her comment on this blogpost. I think I may have gotten things a bit wrong…. When it comes to being published, I think of it in the same way as Commando Dad. See your book, feel your book and in the mean time, keep on hooking. Interesting… Not that I was thinking about getting published at all! Blogfest – how come I didn’t know about this!!!!!!! Sounds fantastic …. crazy busy family life has taken over recently, I have finally found a wee moment to pop on to my little blog and catch up with all my faves for the first time in AGES! Am loveing reading all about this, sooooo wish I had known about it … maybe next year … although November is not a good time … do you think they would move it just for me!?!?!? Maybe yours is to be the best crochet blogger and crochet specialist that you can be. But never give up on your dreams. You always played around with the writing of children’s books, and their illustration. Your theme can be about crochet/craft. Moms/grans teaching it. Make a story about it. Difficulty and article. Children based. Remember: Enid Blyton was the worst mother??? I believe in you.